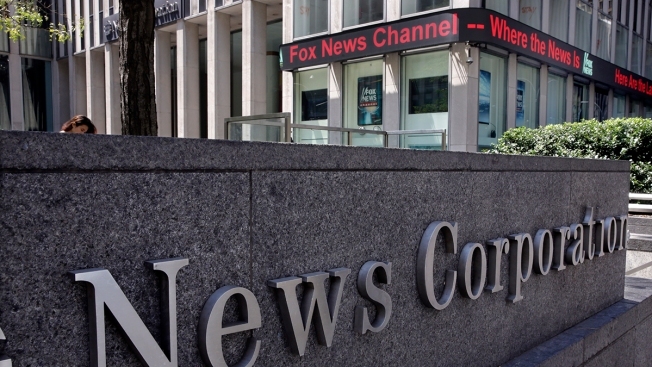 This Aug. 1, 2017, file photo shows news headlines scrolling above the Fox News studios in the News Corporation headquarters building, in New York. The lawsuit claimed Fox News turned Seth's death into a "political football" by claiming he had leaked DNC emails to Wikileaks during the presidential campaign. Daniels said it was understandable that Joel and Mary Rich "might feel that their grief and personal loss were taken advantage of, and that the tragic death of their son was exploited for political purposes." Attorney Suyash Agrawal said in an email that the parents were "of course, disappointed in the trial court's decision, but they look forward to vindicating their rights on appeal." The story quoted Wheeler as saying there had been contact between Rich and WikiLeaks. Wheeler alleged in his August lawsuit that the comments were false and were put in the story to discredit investigations into Russian interference in the 2016 election.